A crisis is an immediate problem with very high stakes—and usually low control—that draws our total attention. It may be a terrible accident, the death of a loved one, a son in jail, a church scandal, a daughter who has run away. Some crises end well. The loved one recovers from the accident, the son turns to Christ, the daughter comes home. We may clearly see God’s hand in allowing the whole ordeal to happen. Other times crises end in apparent tragedy. Joseph’s brothers sold him into slavery and he became a prisoner in Egypt. But years later Joseph could say to his brothers, “You intended to harm me, but God intended it for good to accomplish what is now being done, the saving of many lives” (Genesis 50:20). The moral? 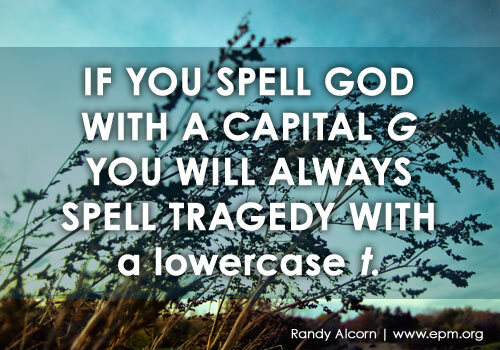 If you spell God with a capital G you will always spell tragedy with a lowercase t. One day, in the presence of Christ, all who know Him will have the benefit of retrospect. We’ll be able to look back and see how all things really did work together for good! Is this kind of perspective in the midst of tragedy restricted to people in Bible times? No! Many people today have exactly the same experience. Joni Eareckson Tada’s diving accident at age 16 paralyzed her from the neck down. But if, in the decades since, you’ve read her books, seen her drawings, or heard her albums, then you know the beauty of Joni’s life. (Nanci and I know her personally, and she has had a great impact on us.) Joni has not just made the best of a bad situation; rather, she has flourished in what God knew for her was—we say this because she says it—the best situation. You probably know a dozen other people in whose lives God has used tragedy to produce beauty. None of us seek tragedy or welcome it. But should apparent tragedy strike—or if it has already—we would be wise to let go of our limited perspective and let God prove to us that His promises are true: “…be content with what you have, because God has said, ‘Never will I leave you; never will I forsake you’” (Hebrews 13:5). Perhaps you’re familiar with the background of the great hymn, “It Is Well with My Soul.” The songwriter had lost his four children at sea. The pain was great, but God’s grace rose to the occasion. Despite his heartbreak, the hymn writer could say without pretense, “It is well with my soul.” Only God can perform such a miracle of grace. And only we can stand in the way of His doing so. Years ago Nanci and I went on a two-week vacation to California. We left the kids with friends and took off on what was going to be our greatest vacation ever.